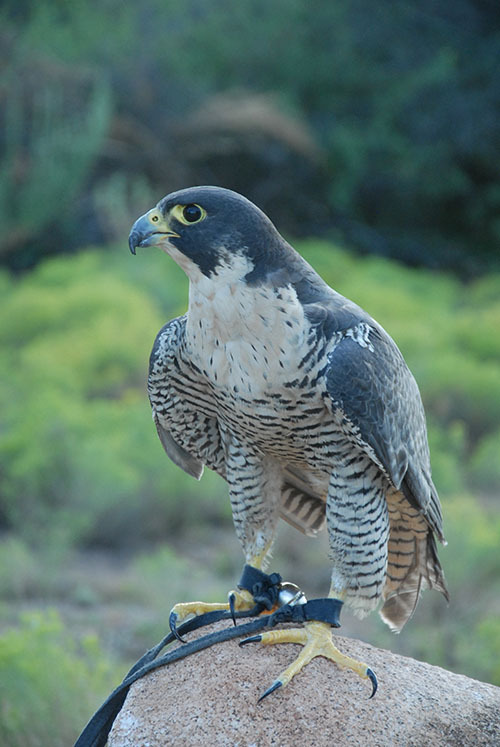 Defiant is a female Peregrine Falcon (Falco peregrinus). The name “peregrine” means wanderer or migrator, and is appropriate for this species as they have the most extensive natural distribution of any bird in the world. Breeding pairs occupy every continent except Antarctica and are found on many oceanic islands. They prefer wide open landscapes with rocky cliffs for breeding, where they will use a hole or ledge for a scrape where the eggs are laid. They do not build a nest. They will also use man-made nesting structures with substrate such as pea gravel. Defiant came to live with us in December 2014 after being trapped by the NYS Department of Environmental Conservation to remove her from a construction site where she was attacking site workers and pedestrians in defending her eyrie. Orders from the USFWS were that she was to be placed with a Master Falconer or be euthanized. We were happy to have her move with us to Arizona.